All I can say is, where was this website before this monster got elected? Where were all the drug reformers warnings about this wrecking ball? Hindsight is 20/20 right? Anybody using their brains, and of course with some moral aptitude, could see that this maniac was a dictator in the making. How could so many people be conned by an obviously, rude and crude excuse for an upright human being? Now I can see how the pre-war German public voted for a madman like Hitler, they were conned just like the public was conned with Trump. Now that Trump is assembling his blitzkrieg, now the public is waking up too late. We will be fighting for our lives for at least 4 years. This rat-catcher of a speaker has the ability to continue to con the people because they are too blind to what President Obama and the rest of the Democrats have done for the legal marijuana movement, done for the country and world. Most of Trump supporters are simple minded xenophobes who are afraid of all they don't understand or is different. The Democrats were about bringing people to accept diversity and differences; and king-elect Trump is responsible for creating racial tension and uncertainty all over the world. There is so much uncertainty out there that it is fueling the current US stock market bubble, that absent minded Trump is taking credit for like he created prosperiety with just his presence. Anybody who thinks that Hillary was sooo bad that Trump was the lesser of two evils, falls for nonsense fake news stories like pizzagate. The overly religious, yet hypocrite Russians, wanted to stop the evil, devil worshipping Hillary. Talk about simple minded paranoia, what are the Russians smoking? Because it is not weed that is bound to get you thrown away for a long time or just simply killed in this 'great' country. Hillary and her spirit cooking is nothing more than fashion for the likes of people like Lady Gaga, Madonna or Mick Jagger. Yet the silly people who shun Hillary for her openmindedness and diversity, still buy devil records. Talk about double standards and hypocrites. Now the country gets an opposite, yet as silly of a fairy tale with the uber religious republican hoard that is assembling to take the country over, with their tainted view of morality. Oh but we got to stop the globalists right? Anybody who listens and supports fake news outlets that bark to abolish globalism are again hypocrites, with their cheap standard of living that US dollar hegemony provides. I dare Alex Jones to stop buying foreign products. I doubt this loudmouth owns much that is "made in America." We all know were Trump ties are made! Again, folks were conned by a hypocrite. Reply to anon asking where this site was before the election. This site, and the organization has been right here all along, and many of us were warning of the dangers of a Trump presidency. So maybe it was just that you hadn't noticed before the election. Because I know many people have been alarmed and have been trying to wake up the sleeping sheep . The main point is that we need to unite and resist now more than ever to try to save the progress already made and to stop any major assaults to the reform movement. Every single citizen that cares must do at least one thing daily to resist what the incoming administration will attempt to implement or undue. The resistance must become a major movement. It is so very important. The thing that is so disturbing is that in order for Trump to win, MANY marijuana supporters had to vote for him. And not by a small margin. What were these people thinking? It seems these marijuana consumers/patients were digging their own grave. Everybody in the drug policy reform community should have seen this coming. But instead they believed a con man who is going to bring jobs back to America, when the next revolution is robotics. And companies will return, naturally to the USA to take advantage of this innovation. WHAT the madman did not tell his simple minded supporters is that he'll bring jobs back, BUT NOT FOR YOU. This will benefit corporate America, and the little guy continues to get bleeped. The way I see it, Trump stood on the shoulders of mr and mrs America, with empty promises that even a third grader could see thru, just so that he could obtain the presidency to ENRICH himself and his family, along with his billionaire pals. Trump will leave the White House RICHER than when he arrived. This is this egomaniac's plan for America. And yes I agree. We have to oppose and criticize this madman on a daily basis until folks start to see thru this creep. It should not be hard to turn everyday Americans against his vision of a kingdom. 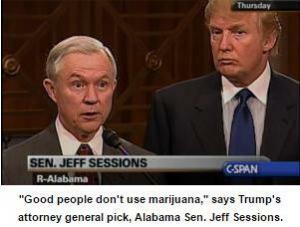 For starters, cannabis prohibitionists are BIGOTS. Get used to saying that. Stop empowering them; it's time to SHAME them! Using the word "wolves" implies that they can supposedly eat us for breakfast. How about WE act like the wolves? ?